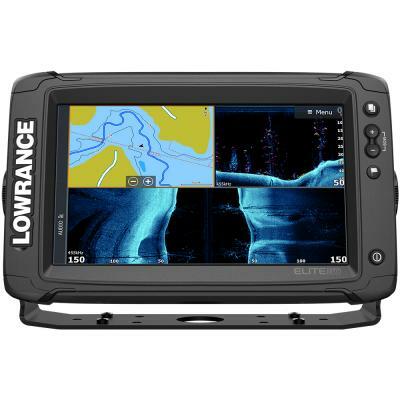 High-resolution, 9-inch SolarMAX™ display that makes it easier to identify fish and structure with new, enhanced screen clarity and target separation. Fish new water like a pro with preloaded US Inland mapping that features 4,000 lakes with 1-foot contours. Narrow your search for productive water, easily locating fish-holding structure like ledges, drop offs and cover. Share sonar, mapping, waypoint and route data between Elite Ti2 displays without connecting a cable with the new wireless networking capability of Elite Ti2. Customize the look and feel of your display with the enhanced color and contrast of Elite Ti2 color palettes, which make it even easier to distinguish fish from structure, the bottom and each other. Optional Americas chart upgrades include C-MAP Insight Pro, C-MAP Lake Insight HD, C-MAP MAX-N, Navionics® HotMaps® Premium, Navionics + and Fishing Hotspots® PRO. Shop, purchase and download mapping upgrades directly to Elite Ti2 displays via the integrated GoFree™ Cloud interface. Enjoy touchscreen control of Power-Pole® Shallow Water anchors, Motorguide® Xi5 trolling motors and the SonicHub®2 Marine Audio server. Get instant access to system controls from the Quick Access Control Bar. Custom Mapping - Optional Americas chart upgrades include C-MAP Insight PRO, C-MAP Lake Insight HD, C-MAP MAX-N, Navionics® HotMaps® Premium, Navionics + and Fishing Hotspots® PRO.